¡Es fácil! offers accessible help to everyone who wants to learn Spanish. ¡Es fácil! focusses on verbs and their conjugations. Verbs describe an action, state or process in the present, past or future and thus form an essential part of a sentence. ¡Es fácil! 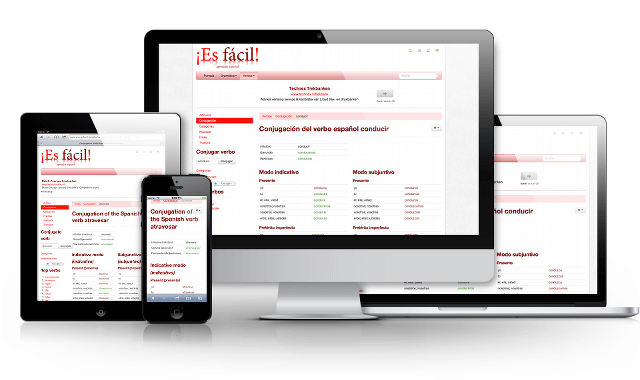 provides full conjugation tables of more than thousand regular and irregular Spanish verbs in all modes and tenses. You can also practise these verbs online. Besides conjugations also translations in various languages are provided. Besides verbs ¡Es fácil! also treats other grammar subjects, like: prepositions, word stress, pronunciation, numbers and time. For these subjects also a couple of online exercises are provided. Learn French with C'est facile! Find verbs in various languages with verbfinder.com. Find esfacil.eu on Facebook and esfacil.eu on Twitter. ¡Es fácil! is the successor of español @ markuz.